Who is called Custodian of Cargo? Afterarrival of cargo at port of destination, it is moved to customs bonded area. The custodian of goods at destination customs location could be owned by a private party or parties, semi government firms or fully owned by government. However, customs bonded area is functioned with a memorandum of undertakings by Customs department, carriers of cargo and custodian. A custodian of cargo can deliver goods to the consignee only after approval by customs department and carrier of goods. In other words, the cargo can not be moved out without the permission of customs and carrier other than custodian of cargo. How is Cargo delivered to consignee by Custodian? Once after completion of import customs clearance procedures, the importer or his customs house broker approaches the carrier of goods to release cargo. After necessary completion of formalities by submitting original bill of lading and other required documentation by effecting any dues to the customs broker, the carrier of goods issues a delivery order to custodian of cargo to release the goods. The importer or his agent applies with custodian of cargo to release goods along with the necessary delivery order issued by carrier of goods and the proof of completion of import customs clearance procedures. After collecting any dues if any, the custodian of cargo release goods to the importer or his authorized agent. Have you satisfied with this article about custodian of Cargo in Imports? Would you like to share your experience about Custodian of Cargo? Comment below about custodian of cargo in imports. Manish Jain : On 17 February 2015 I am working in Adani Port and SEZ Ltd and want to have one query that what is the responsibility of Custodian for Delivery Order given by Vessel Agent. If Agent is not given delivery order and Custodian received Bill of Entry cleared from Customs then is Custodian can give delivery to receiver without delivery order or what ? Admin: On 17 February 2015 Hello Manish Jain, The custodian of cargo can not deliver import goods with only import customs cleared documents. The custodian has to receive Delivery order (Deliver orders) from carrier of goods to whom the AWB/BLL OF LADING is consigned or to order. Rishabh Sharma : On 20 April 2016 Some of my relatives are operating a software company and currently dealing only in India but in future they want to expand their operations worldwide. They asked me some questions,Which are as follows:- 1.Is it necessary to obtain IEC Code for export of Software services outside India? 2. 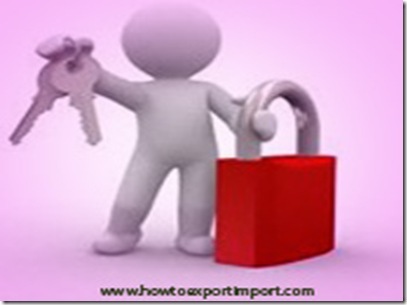 What other points one should consider while exporting goods? 3. Tax Compliance on Export of Software services? I have searched my websites but not found any satisfactory content. please help me to clarify these questions. How to export from India to Syria?